I have read countless books of wisdom during the last 12 years of my journey into personal growth and spiritual development. Books which have inspired me, motivated me, even frustrated me. Some have elevated me to new heights of what’s possible for human beings, others have made me cry. I thought I had read all the best ones – and then along comes a gem of a book filled with such exquisite wisdom and stories of passion and compassion. The sort of book I aspire to write myself one day. 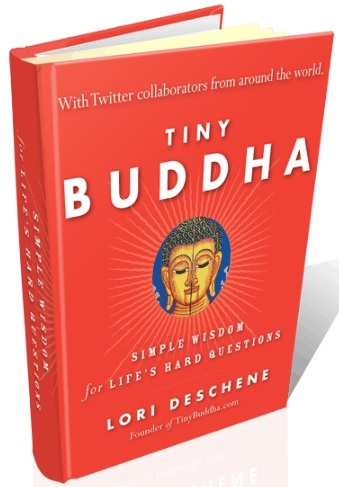 I first came across Lori Deschene almost three years ago when a friend told me about Tiny Buddha and I started following her on Twitter. I received this book a few weeks ago and read through it in just a few days. But it’s the sort of book you can pick up again and again and open up on any page for some ageless wisdom. Lori beautifully shares her own life journey and how she ultimately found herself. Best of all, she has garnered knowledge and wisdom from around the world by engaging her twitter followers. There are hundreds of quotes from bloggers and other social media friends who follow TinyBuddha. 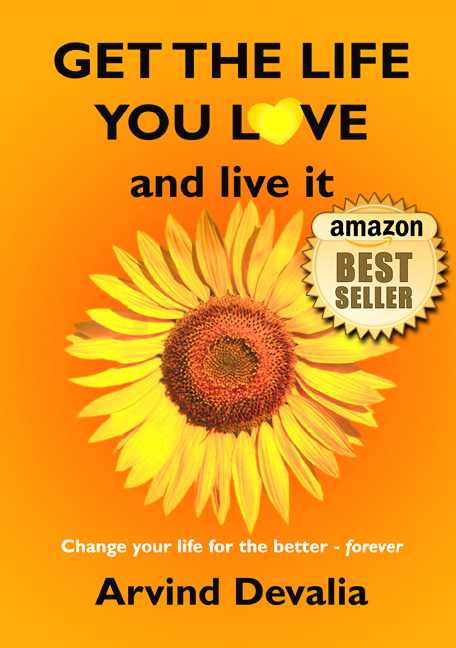 So really, it’s quite a unique book created through the power of social media. I am delighted to have made my own little contribution to this gem of a book. And it’s been a real challenge for me to encapsulate what this book means for me. 1. The truth, as messy as it sounds, is that the only way out is through. 2. Maybe if I stopped trying to control how I hurt, I’d feel a pain that would teach me what I need to do to love life more and need pain less. 3. We can take almost anything that hurts and recycle it into something good once we’re ready to learn from it. 4. The moment we decide things don’t have to be a certain way, we create the possibility that they could be better than we know how to imagine them. 5. Being disliked and misunderstood by some is worth the freedom of knowing you are loved and supported by many. 7. Through learning you can become anything; through growth you can make sense of anything. 8. The very act of making a different choice is in itself change. 9. Perhaps the best question isn’t how long does it take to maintain a life change, but rather, how can we deal with the emotions that get in the way of forming a new routine. 10. The best thing we can do when we’re feeling things that make it tempting to stay the same is to create space between the feeling and the behaviour. 11. We are never stuck. 12. Everything that goes on around us affects what goes on within us. 13. We can’t change that life always changes, but we can learn to change with it. 14. What’s a more productive use of our energy – searching for meaning outside ourselves or creating meaning within ourselves? 15. We are the ones making the choices, and regardless of everything that influences them, we’re the ones who need to be accountable. 16. You don’t need to worry about forever; you just have to choose to use this moment to create the future, instead of letting the future create you. 17. We can’t change the nature of things, but we can change how we interpret it. 18. You’re not just creating your own happiness. You’re showing other people it’s possible. 19. Relationships are hard because we fight for our perceptions. 20. There is something to enjoy and appreciate in every moment, if you’re willing to stop resisting what is. 21. Appreciate the highs, the lows, the small things, and the big things. So there you are – timeless pieces of wisdom from the not so TinyBuddha. I love Lori Duschene and Tiny Buddha! Congratulations, too, for being part of the book! !I often find myself at her website. Her quotes are beautiful. However I have not read the book yet. I think it’s about time. Thanks, Arvind, for reminding me! Oh, I needed something like this so badly today… and now it is here. Tathata, glad you liked this post. Wait till you read the book! Beautiful post with 21 (and more) gems. I am a fan of Lori’s. Really loved this, Arvind. Thank you! I’d like to read the book. Vidya, Lori sure is a gem! 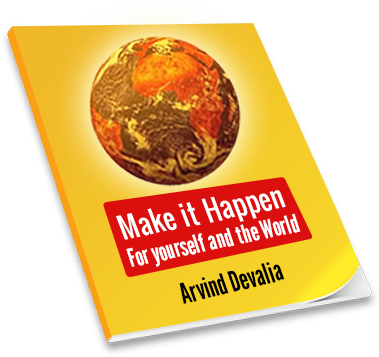 Wait till you read the book – you are in for a treat :-). I particularly connected with #17: “We can’t change the nature of things, but we can change how we interpret it.” This is one of the themes of my life. Perspectives change everything we experience in life for the better or the worse. Learning to choose the perspective that best serves us is one of life’s most important lessons. Ken, I am glad you also like the book. Lori has truly written a classic. Thank you Arvind for sharing about this book. Hope to get a copy soon and have shared with others who I feel would also benefit. Mica, welcome back to my blog.